I had liked this young artist's voice so much I had bought both his albums. However, recently, he attended one of our parties as a guest and I was very impressed at how professional, extremely polite and sweet this artist was. 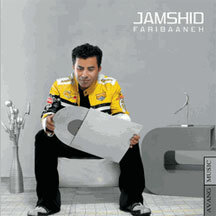 He graciously offered to send me his latest album -- "Faribaaneh" -- to listen to but I declined and asked for his website (Jamshid-Music.com) which I visited and loved the sample track I heard. Thanks to eWorldRecords.com for processing my order overnight, I was delighted that the package includes a DVD featuring 7 videos of songs from his three albums. I love al his lyrics and the third track "Tarke Ghorbat" is one of the most heartfelt and beautiful songs about Iran. I cried so hard I lost my voice for two days. The versatility of this artist's voice is evident in singing different styles of music and I sincerely hope one day he releases a complete album of Kurdish song as well as one featuring traditional songs which his voice can carry.